This is a write up on my thoughts on a 260 frame shot I animated. Out of all the choices I could have made, I feel I learned alot from the ones that ended up on the screen. This is an over analytical overview of what I was thinking, when working on the shot, and why. In the end, The shot got a 4th place finish in the 11 second club’s aug 2009 competition. Thanks for all the kind words and support! While I was between jobs I needed to keep animating in order to keep learning. I wasn’t around many animators at the time so feedback was minimal. While I did have feedback from what I would post online, I really wanted to dig in and just see what came out the other side. After working in a studio for a while, I was excited about getting to animate a shot how I wanted to. I checked out the 11secondclub.com to see what the AUG 2009 audio clip was. Usually I dont really like the clips on the site, but I thought the Aug. clip was fun. I started brain storming ideas and the only real solid Idea I had was that I wanted to have the character typing at one point of the shot. 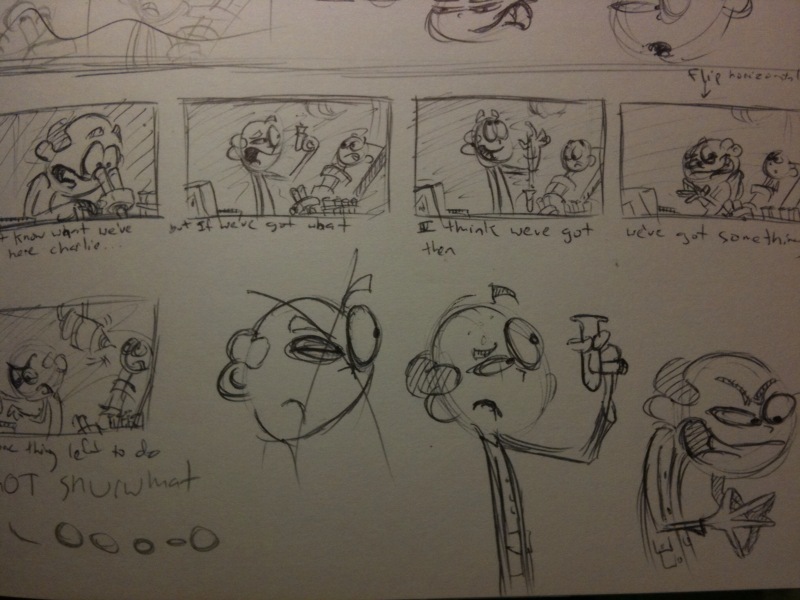 Not having a very strong idea of what I wanted to do, I started thumb-nailing shot ideas while listening to the audio. I could only do this for about 30 min before I felt like throwing the speakers out the window. ha. Eventually I had this idea of a mad scientist. It was one of my first ideas so I figure it would be to cliche’. And it was…There were about 9-10 mad scientist shots in the contest, BUT I decided that I would still have fun with it, and that this was for me, and not so much to win a contest. I knew that I could do whatever I wanted with the animation, and that was all i needed to motivate me. I only had about two and a half weeks to come up with an idea and animate the shot so “pre-production” went out the window. 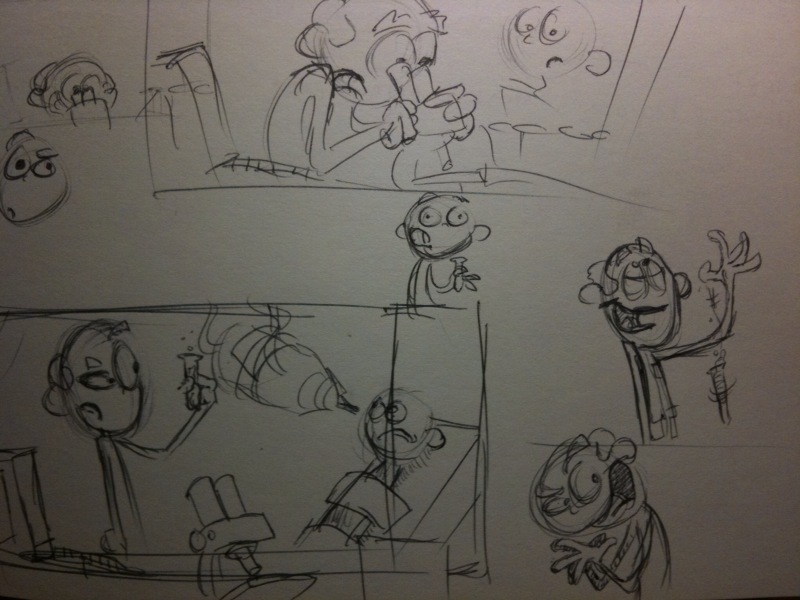 here are the thumbnails…I didn’t do alot of thumb-nailing. I did some video reff, but it ended up being pretty useless in this situation. I had some fun ideas for the shot and I decided I’d like to try all the ideas out with the animation. I know I wanted to have the character Type… I know that sounds like a strange thing to want to animate, but I had never animated typing, and all the shots I’ve seen of characters typing always felt the same. It usually feels very muddy, and broad. I wanted to try a new type of typing animation. Another thing I wanted to do was to see how I could try pushing the Lip-Sync. I felt like I needed to get the personallity of the character to read through the mouth shapes. I wanted to try animating the mouth first, before the eyes and brows… Normally I find that this is done the other way around.. but I was thinking that if I could get the personallity to read with the eyes closed.. then maybe that would lead to new “methods” of acting, and or animating…. In the end it led to a bunch of over-animated lip shapes…. but I did learn from it. And I’ll take that anytime. One thing I really wanted were to get some cool posing and contrast into the shot. I did some thumb-nails that I really liked so I figured I’d try them out in 3d and see if I could get the same feeling as the drawing. I feel like I got most of the way there but when I played the animation I felt like I just had to much going on. It felt like I wanted to animate breakdowns instead of story telling poses…Well I could blow it all away, or see if I could make it work. Knowing that I was getting very “pose to pose-y” with the shot I decided to go ahead with it, and see if I could still make it work. Why not… I’ll only learn from this. The new challenge for me was to now playing with breakdowns, and making the Lip sync read through these poses. I feel like I did ok with that part. over all, I find the shot has a very “animated” feel…and because of this, the character seems flat. Another thing I really wanted to play with is seeing how I could simplify the lip-sync and still have it read as strong as the characters actions. Its a find balance between chattery lip-sinc, and a performance that is soft and muddy. I feel like I got both the Chattery feeling at some parts and the soft and Muddy at others. Although some of the lip-sync works and is interesting, I think I could have done a better job at animating the lip sync to help the movement of the shot. But I gained some knowledge from it. So While animating this little clip I was constantly trying to figure things out, and try something that was a little bit out of my comfort zone. Most of the shot was animated straight ahead, so it took longer than it needed to, but I wasn’t in a hurry so I didn’t mind that I kept having to redo things. If I had to crit this shot, I’d say its way to over animated. There are to many poses in the shot. I could have probably done two or three and it would stronger. The lip sync is competing with the eyes and brow animation a little to much. The same with the acting. It reads as a battle between the facial animation, and the body movement. Because of all this the shot seems very flat, and there is no real point to connect with the character. So over all, the shot feels very animated and flourishy. What are some things did I learn. 1. Keep things simple. This doesn’t mean the character cant move and act. but more so, keep the main idea of the shot clear, and supported. Dont add to much fluff. 2. Make sure your animation complaments itselt. For example. the facial animation isnt competing with the body animation. Its like watching tv and listening to the radio at the same time.. you’ll loose focus on one or the other. 3. Keep your Lip Sync moving some place. think of the lip-synch sort of like phrasing. you dont want the shapes and movment to be the same all the way through. Have it lead to an accent, or into a pause etc. 4. Dont just “animate” the character. some of the breakdowns in the shot seemed too animated. There is no reason for the hand to do a real flourishy arc. Its distracting, and feels fake. Make sure everything is supported. If its an animation style, thats fine, but the rules still apply. What ended up being my favorite part of the shot…. My fav. 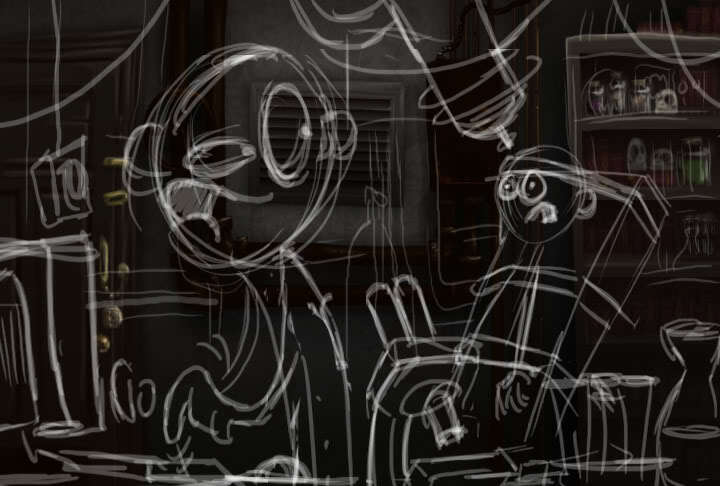 part of the shot is the tiny adjustment the character does on the microscope with his fingers. And thats one of the first and easiest things I did. I hope you find this interesting. Its sort of tearing apart the shot from the inside out. As animators, we have to keep out own standards high so that we never stop learning. If something In your shot seems weird, keep taking passes, and talking to people to figure out the problem. If you just pretend it’s not there then you have wasted your time. Keep pushing and learning and you will always be satisfied with your shot, untill the you have animated your next shot.Try to explore new ways to animate, this is an art form so please try new things. This will only make animation grow. The last thing we want is for every film to be a cookie cutter version of another animation style. So thanks for reading! Let me know what you think! thanks for sharing this with us Malcon, it is great to hear an animator taking us through his thinking process. I have also started recording similar things at work and will share them once the game I work on is out. The post on “Tangled” I meant to post here. My mistake. What a great blog post Malcon. 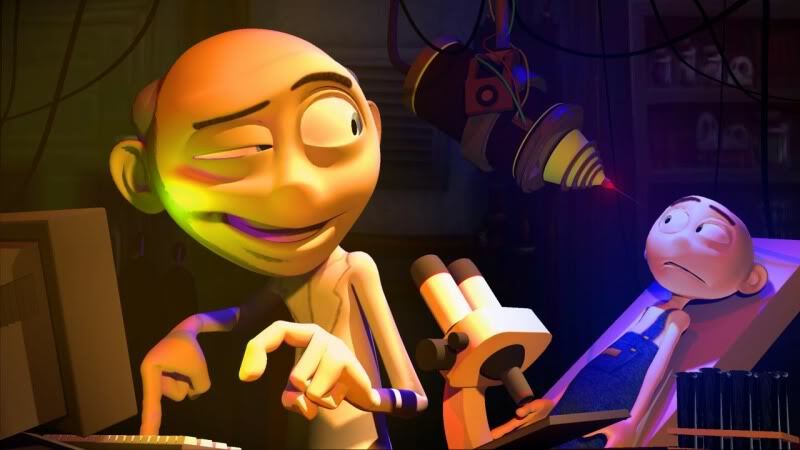 It’s interesting that you continue to experiment with different approaches to animation. Great stuff. Got it. And yes Keep trying new things!! its fun. Thanks for sharing your experience , this was simply great.